Founded in 1966 to “stem the rapid destruction of historic properties in Lancaster County,” the Historic Preservation Trust of Lancaster County’s mission is to encourage and facilitate historic preservation throughout the county. The Trust has been directly involved in preserving more than three dozen important Lancaster County landmarks and has provided advice, assistance and guidance in the protection of others. The Trust is a member-supported, 501(c)3 non-profit organization located in the historic Sehner-Ellicott-von Hess House (1787) at 123 North Prince Street in downtown Lancaster. The Historic Preservation Trust of Lancaster County is located in the historic Sehner-Ellicott-von Hess House (1787) in downtown Lancaster. 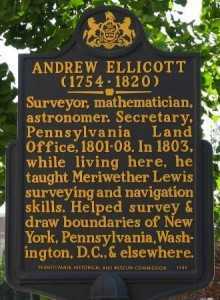 It was in this house that Andrew Ellicott (1754-1820) taught Meriwether Lewis (1774-1809) navigation skills before the Lewis & Clark Expedition (1804-1806).